For all you twitter followers and fiends, a great collection of drawings by LA/NY artist, Odessa Begay, has presented a literal translation of celebrity tweets into a visual showcase. In just a 140 characters, Twitter has become a viral news sources to many media degrees, all the while, Odessa’s drawings have become the new political and social cartoon commentary that parodies the allusion of celebrity news and gossip. The inspirational celebrity tweets, that are both submitted and followed, fuels Odessa’s illustrations to take content out of context. The fanciful interpretations play up a satirical caricature within the celebrity’s mindset, whether they are defending media gossip to their everyday altercating relations with reality. 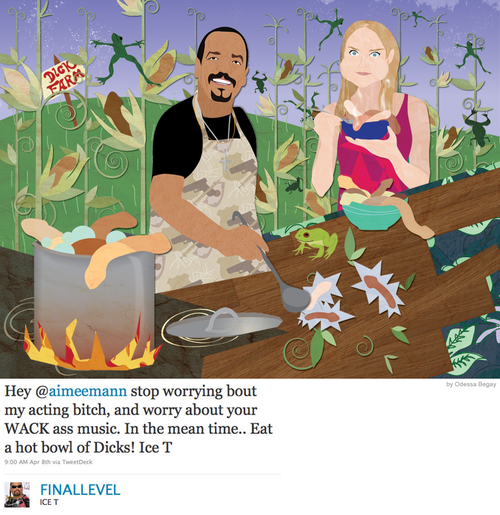 From Anderson Cooper’s Sexual Healing to Jim Carrey’s neighbors, and most recently revealed (above) Ice T vs. Amiee Mann, the pictorial conversation is gathered into a museum that acquires new works every Tuesday. Odessa’s drawings are charming and a breath of fresh air. Check out the links to Odessa Begay’s Museum of Modern Tweets site, Odessa’s personal site, and a Wall Street Journal article about Odessa and the Tweet Museum.